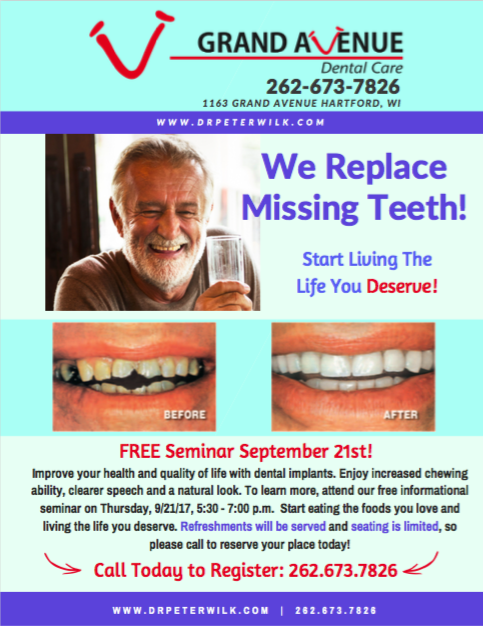 Join Us for a FREE Educational Seminar on Tooth Replacement! Part of our mission of Sharing Smiles means that we do everything we can to educate our patients and our community about their dental health. Tomorrow we are hosting a FREE Implant Seminar to discuss what tooth replacement options there are, how they compare to each other and hopefully help guide you to determining which option would be best for you! If you or someone you know is interested in this, please reserve a seat by calling our office at 262-673-7826! You do not need to be a patient to attend and there is NO COST for this event!